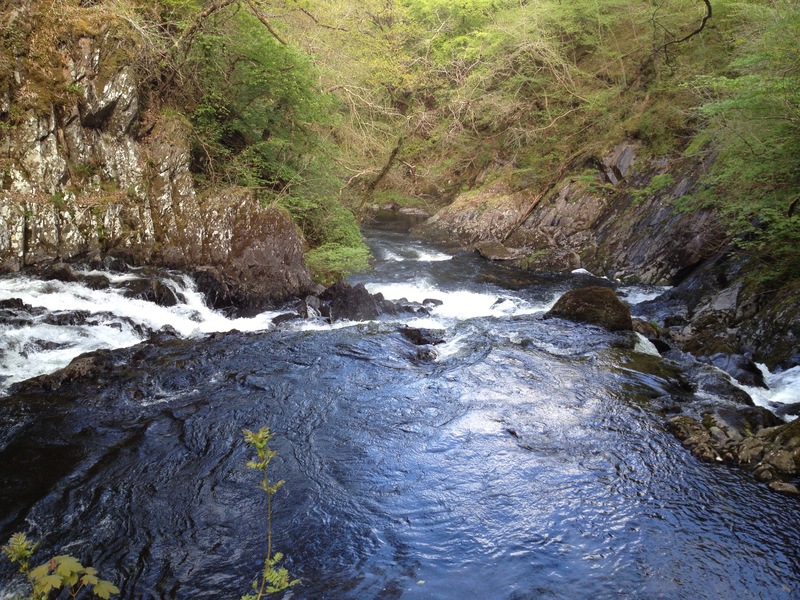 Francesca and Elaine reveal the inspiration behind some of their short stories. Francesca: While the ideas for my short stories come from numerous sources, I have to confess that a number of them have come from my own family. The tales I build around these incidents are generally fictional, though there are exceptions. More on that later. Allas (as ‘It’s My Life!) and Woman’s Era. On one occasion I was trying to recall my great grandmother’s old fashioned scullery for a story set in World War Two. 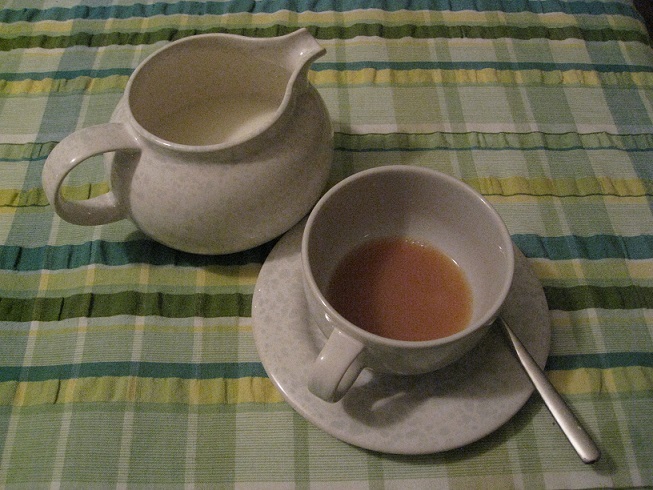 I was wondering what happened to the numerous coronation mugs on her dresser, some dating back to Edward VII, when a new story was born. 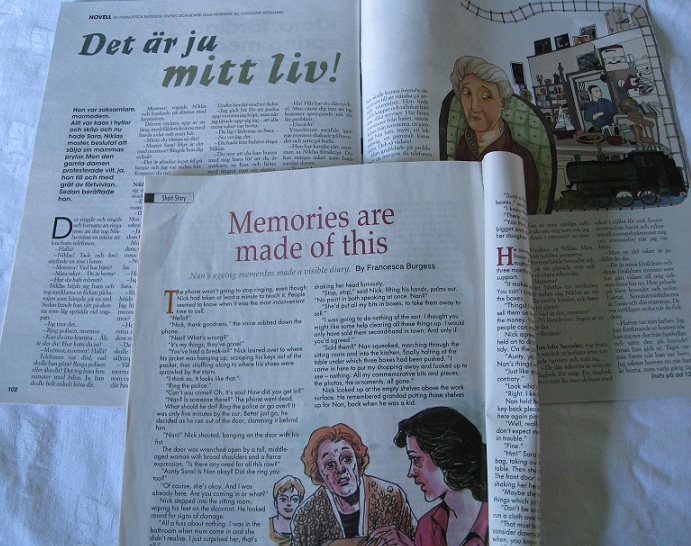 Memories Are Made of This, published in Sweden’s Allas and India’s Woman’s Era, is about, ‘Nan’, who hoards far too much memorabilia. Her daughter, rather unkindly, calls it ‘tut’ and attempts to clear it out. My gran wasn’t a hoarder like Nan, who luckily has a grandson who comes to the rescue. ‘An Alternative Christmas’, renamed for The Weekly News. 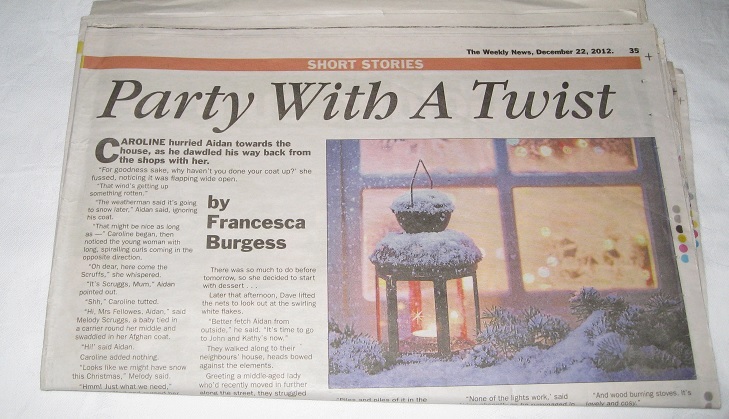 The inspiration for An Alternative Christmas (published in The Weekly News as Party With a Twist) came from my older son and his partner, who are what some would call, ‘alternative’. It’s the tale of a street suffering a Christmas power cut and how you shouldn’t always take people at face value. 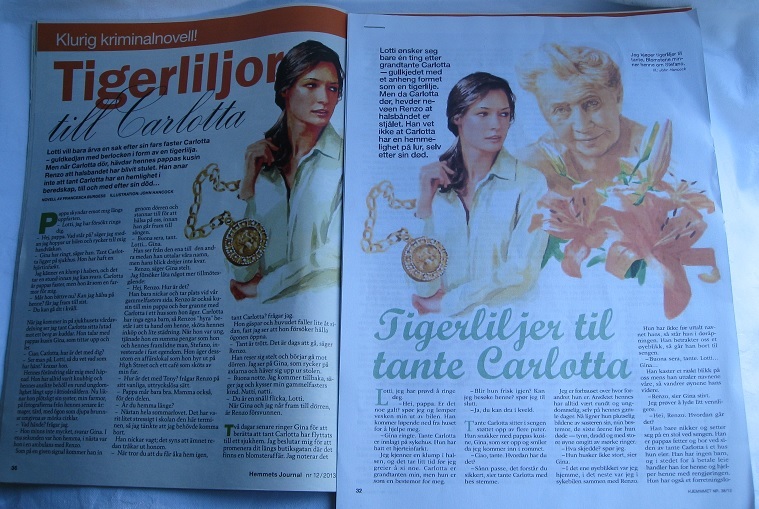 Tiger Lilies for Aunty Carlota, published in Norway’s Hjemmet and Sweden’s Hemmet contains rather more of the original thirty-four-year-old tale. In it, Lottie loses her favourite great aunt and one of the older nephews, Renzo, tries to squirrel away the aunt’s possessions for himself. In the process, a tiger lily necklace, willed to Lottie, goes missing. 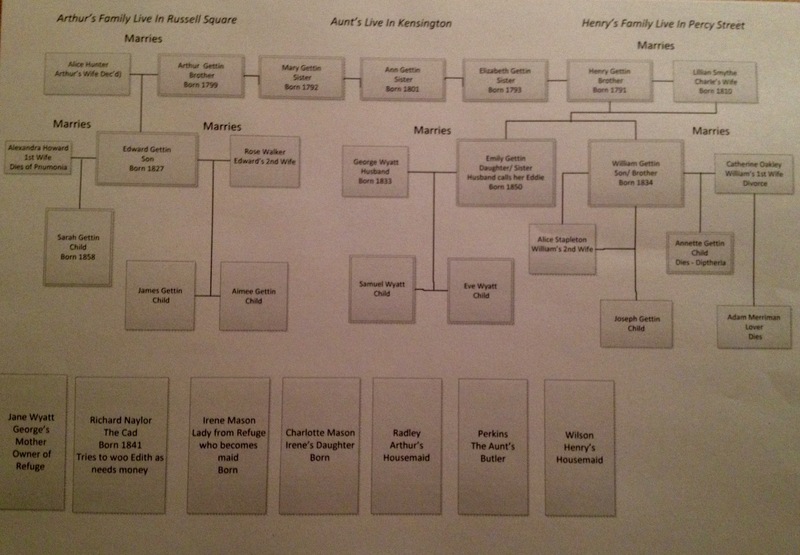 Aunty Carlota is based on my great aunty Carmela, and Lottie is me. Renzo, in reality my dad’s cousin Luigi, did much to manipulate my aunt’s will and stole items that were meant to be part of the estate, including a necklace (a Madonna rather than a tiger lily). The tiger lilies came about because I took a bunch of them to Aunty Carmela a week before she died, as does Lottie. The story’s theme of avarice and how cheaters don’t prosper sadly wasn’t the reality. Sometimes it’s very satisfying to put right a wrong, if only in fiction. Elaine: I often get ideas through conversation or people watching. The news or articles also often spark ideas, as well as looking at old photographs. Once I start mulling things over, my idea tends to sprout wings and it takes me wherever it wishes to go. I’m not altogether sure what sparked my ideas for the short stories I have written, or the novels, mainly because some of them have been quite random. Other story ideas that I’ve had have evolved. I wanted to write something about going to a garden centre, no idea what, but that ended up being how it ended. I think I usually have a one sentence idea, which is usually a setting, like the garden centre or an office, but that quite often doesn’t end up being what my story is about. 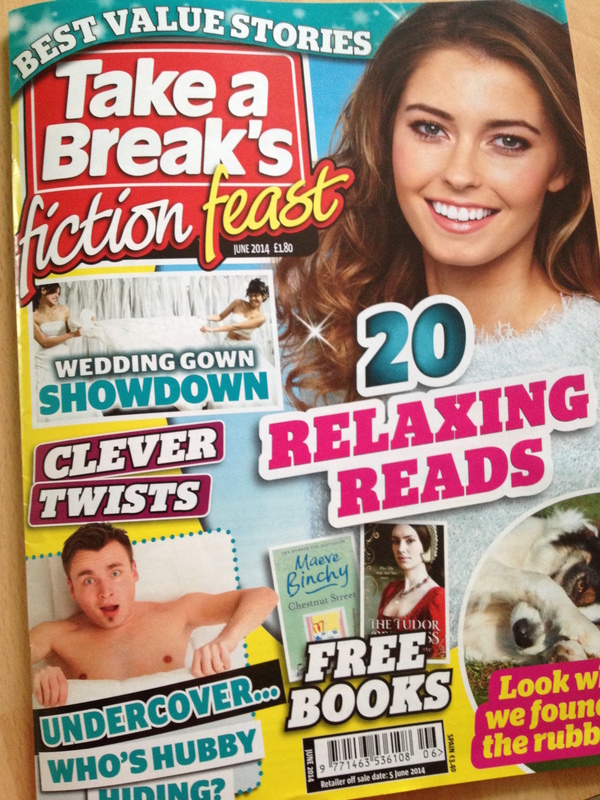 One of my favourite short stories, A Dorothy Moment, was published in Take A Break Fiction Feast. 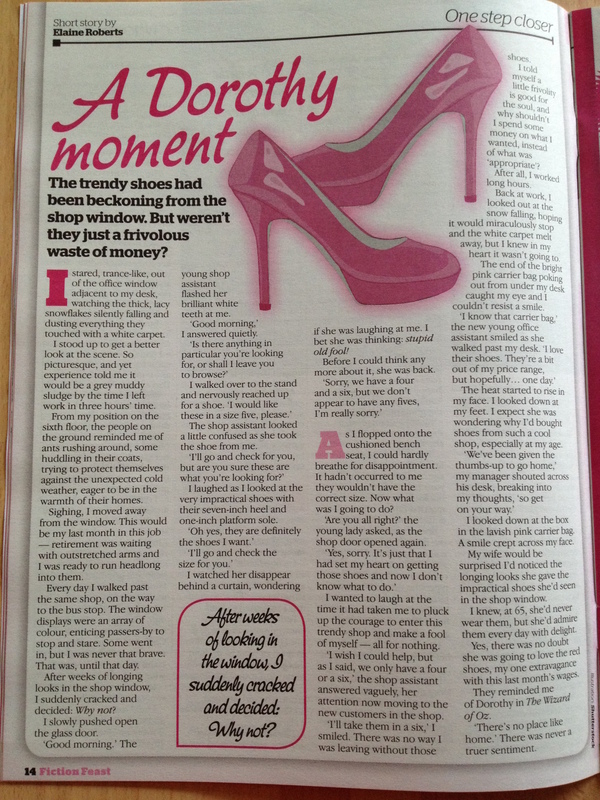 The story was about someone retiring from work and buying a pair of high-heeled red shoes that would never be worn. The idea came to me as I stared aimlessly out of the office window where I work, wishing I could retire, and that is how my story starts. It is written in the first person and all through the story, it is believed that the modern shoes are for that person. It is only when the end of the story is reached, it comes to light that the husband has bought them for his wife. He knows she could never possibly wear them but he has seen her eyeing them in the shop window, so it is his last extravagance before he retires. That’s what staring aimlessly out of the window gets you. What has inspired some of your stories? Elaine chats about building her stories from the very beginning. Last week, Francesca and I talked about what we automatically put into our writing and also what we leave out. That made me think about my process of working, so I thought I would share it with you. First, it’s the idea of the story, which often starts off with something vague. As an example, Forgotten Love started as a mother who had wanted to return to education. That brought up a whole list of questions. Why had she left her education early? Why had she married young? Why did she want to return to education? What did her family think about it? Did they support her, if not why not? What issues did she come across on her journey? What relationship issues did it bring up? 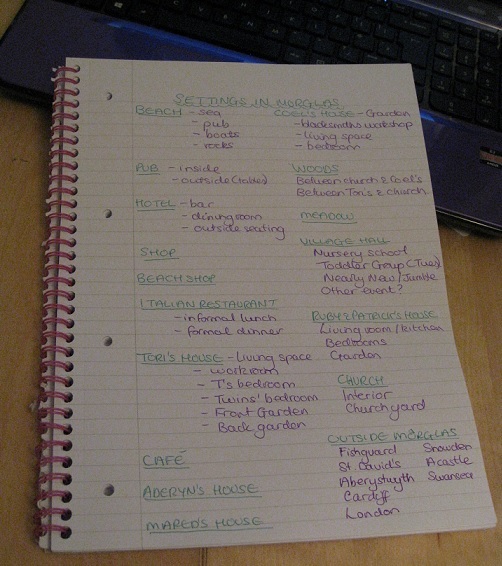 These are only a few of the questions, but as you can see, my vague idea has given me a lot to think about. From these questions came the brain storming, or mind mapping, no matter how ridiculous the conflict might have seemed, it was written on there. You never know where one idea can take you. 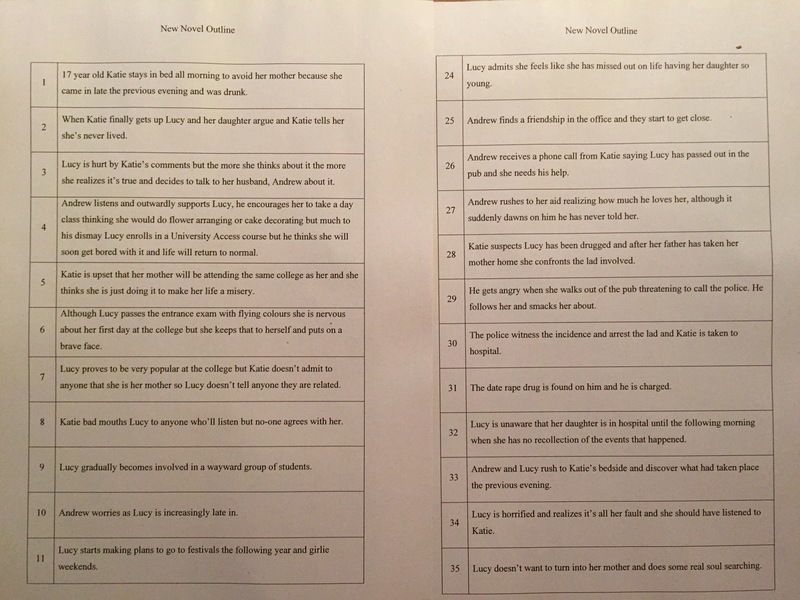 Once I had chosen my preferred elements of conflict, I then wrote the synopsis, which proceeded to be converted into a chapter breakdown. Excitement buzzes through me as the novel begins to take shape. Obviously there are gaps in my chapter breakdown, but that’s what gives me the artistic licence for my story to evolve. 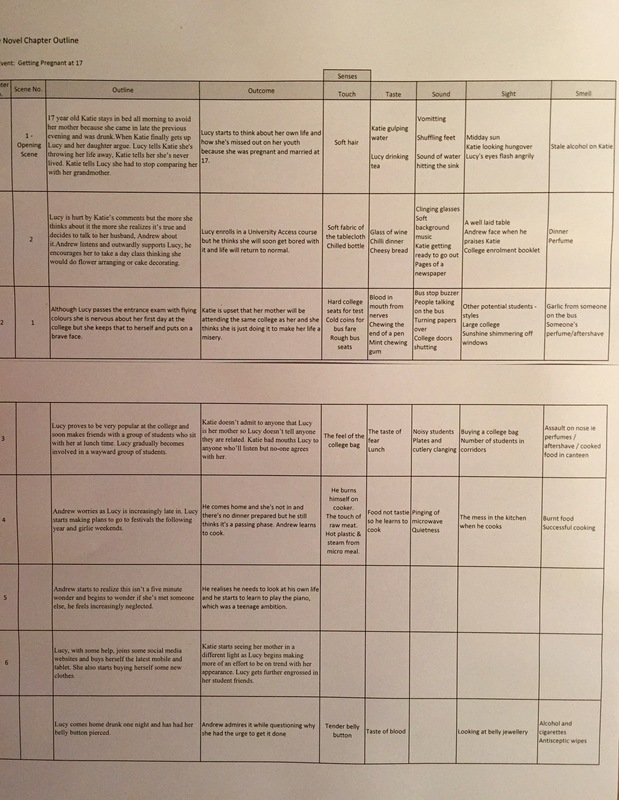 Part of my process also involves a scene plan. To coin somebody else’s phrase, you know who you are Elaine Everest, this is a shopping list of what each scene should include, as in what I want to happen and what senses could be used. My first draft begins. In the past, I have used NaNoWriMo (National Novel Writing Month), in November, to write my first draft, mainly because it doesn’t need to be correct. My first draft is just about getting the story written, then I tear it apart and add in the obvious things I have missed out. The five senses, and often description, are the areas I’m usually lacking in. 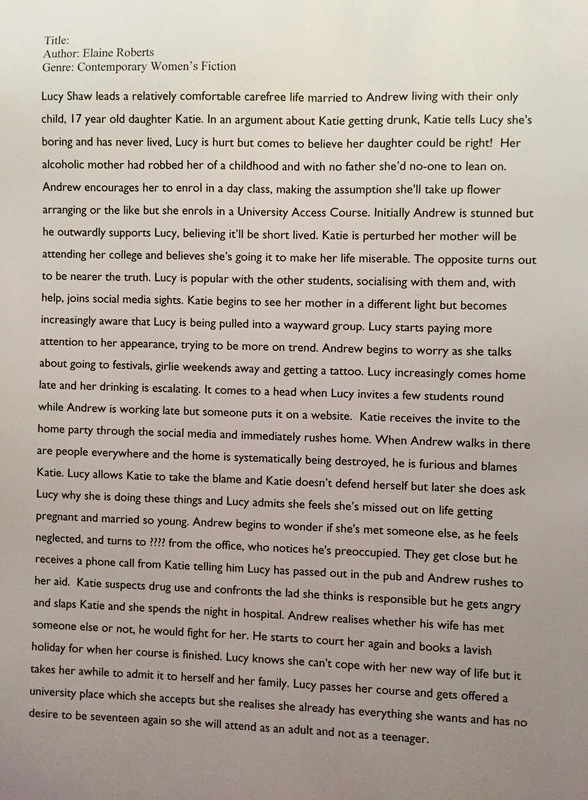 After the editing process, which for me is the longest and most time consuming part of my novel writing, I revisit my synopsis. Maybe I should change that last sentence because my synopsis always feels like it takes forever to get right. To get my story onto one sheet of A4 paper always feels like a mountain I can’t climb, but obviously I do, eventually. I am sometimes asked whether I enjoy writing and the overall answer is probably no. I enjoy the first draft, getting the story down, but getting it book shaped, as Julie Cohen calls it, I find to be painful. However, it’s like a drug, I can’t help myself. I have lost track of how many times I’ve said that’s it, I am not doing it anymore, but less than an hour later I’m back fighting the demons and getting my manuscript book-shaped. The question is, am I alone in this? Please tell me I’m not.